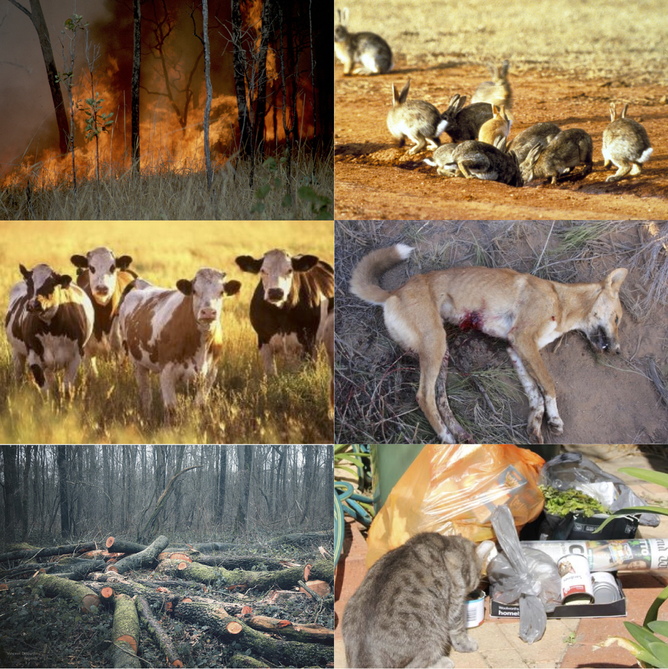 Six key disturbances that interact with invasive predators, clockwise from top left: fire, altered prey populations, top-predator declines, resource subsidies, land clearing, and grazing by large herbivores. Clockwise from top left: CSIRO (CC BY 3.0); CSIRO (CC BY 3.0), T Doherty; T Doherty; endymion120 (Flickr, CC BY 2.0); USDA (public domain). The paper is free to download until July 30 2015. Tim Doherty is PhD Candidate at Edith Cowan University. Chris Dickman is Professor in Terrestrial Ecology at University of Sydney. Dale Nimmo is Lecturer in Ecology at Charles Sturt University. Euan Ritchie is Senior Lecturer in Ecology, Centre for Integrative Ecology, School of Life & Environmental Sciences at Deakin University. The link below is to an article that reports on a very successful experiment in saving Little Penguins on Middle Island in Victoria, Australia.